The Xero integration in Preno is really fantastic - all of the information about your guest's stay is bundled into an invoice on checkout, as well as information about how they paid. You'll need to turn on the integration first (when you're first setting up your account) - you should check with your accountant to make sure that your chart of accounts is set up properly. In your Preno account, click on Settings. Click on the Integration tab. 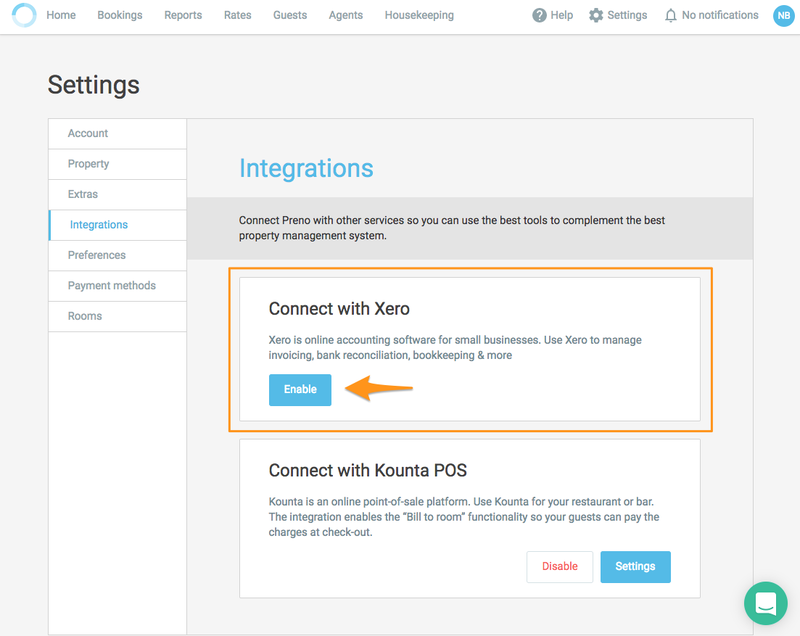 Click on Enable in the 'Connect with Xero' section. 2. A pop-up window will appear - you'll be asked to login to your Xero account (if you aren't already). After that, a blue button will appear asking you to Allow access. You'll need to click that to connect Preno and Xero. 3. Now you'll need to map your Preno accounts to your chart of accounts in Xero. Preno will automatically pull through the relevant accounts for each type, and then try to match them. Press Save when you're done. 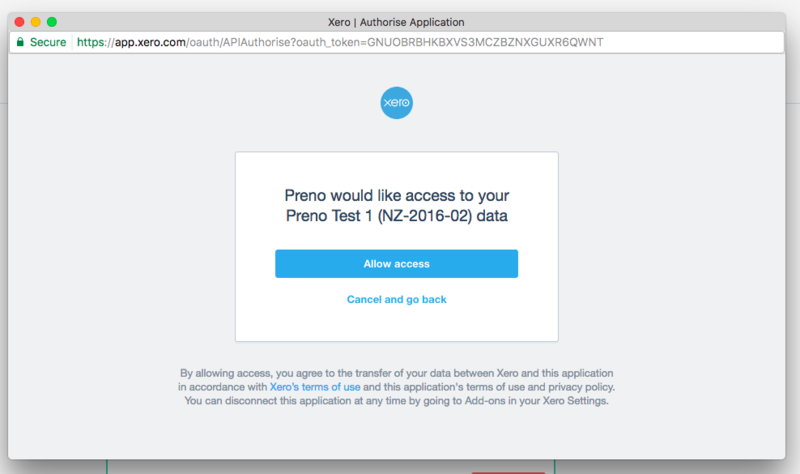 Preno requires you to map your accounts in Xero to your accounts in Preno. It's important to get this right, because the different accounts have different effects on your financial statements in Xero. In order for these accounts to be visible in Preno, they must have Enable payments to this account set. Each account must have a unique account code, too. Deposit: All prepayments or deposits that your guest pays will be stored in this account. The unearned revenue in this account will shift to Accommodation on checkout. If you don't select an account for deposits, then you won't be able to record them. This is a current liability account with GST enabled. Bank: You'll want to code this against your business account in Xero. This is a banking account with no GST. This is for anyone who uses tracking categories in Xero to monitor revenue and expenses across multiple sites. This is optional - you don't need to select one if you don't want to. Missing an account in Xero? Preno can create the account you need too. On the right hand side of the drop-down, click Create an Account. Pick the code and name you like, and you're ready to go! We'll pick the right account type and whether or not it needs GST. We really recommend getting in touch with your accountant to make sure that your accounts are mapped and set up correctly. If your accountant isn't familiar with Xero, find an Advisor near you that can help. We can introduce you to local partner accountants too.